Materials: Worsted Weight Cotton (Sugar N Cream or Peaches N Crème -Each ball: 2.50 oz / 70 g, 120 yd / 109 m) One ball in an Ombre'. The other is a solid. We'll start from the bottom and knit up. 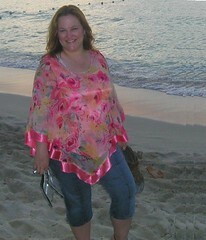 The skirt part of the halter is a fan & feather pattern knit flat. Repeat Row 1 through 4 one more time. See the photo below. It only shows two ridges on the bottom. This makes it look like it has ruffles. Knit these 4 rows until piece measures 8 inches long. The last row 4 should be a ridge row (or you knit it). See the next photo as an example. Next, we need to decrease 24 times across the fabric to make the total number of stitches cast on to be 84 stitches. Switch to Yarn B, K all stitches and join in the round. Place marker. Knit in the round till the stockinette part of the halter measures 3 inches. Next, you need to work on the front halter part of the top. K63 stitches, Bind off 42 stitches. Now you'll knit flat again. Repeat these two rows until halter measures from the bottom CO edge, 13-inches. 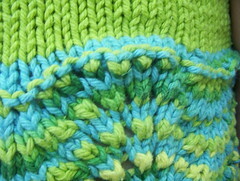 Picot Row 4: BO in Purl stitch. Next we need to make the straps. Looking at the back of the halter, count 10 stitches from the side & pick up and knit 5 stitches. Knit these stitches in a garter stitch (k5 each row) till the strap measures 15 inches. Make a button hole: K2, YO, K2tog, K1. Knit two more rows and make another button hole. Knit two more rows, then bind off. Do the same thing on the other side (count 10 stitches from the other side, pick up and knit 5 stitches, etc.) The photo below shows the beginning of the strap. Sew two buttons on the inside of the picot edge (see the picot edge photo). ETA: I made the top 24" in circumference. M's been that circumference for quite some time From the YarnStandards.com site, this size would put her squarely in the size 5 category - but she's very long and has been wearing size 8 for the past year. The top needs to be snug to fit. If the top is a little big, it does look cute with a tank underneath (see Gea's top - her daughter is wearing a tank under it and it's still cute) and can easily grow with your girl. Note to Amy: Whenever I mention "sew", I do mean to use a needle and the yarn (hand sew). Also, give me your 8 year old's chest measurement and I'll see if I can whip one up. M is now 9 and would probably like another one. This is extremely cute!!! I shall have to make one for my little girls. Thank you for sharing! so adorable - what a cute model! That is awesome!! I think it is adorable. I've been knitting since October '05 and love this hobby. I also like to try fun and interesting things and then blog about it. By day I'm a Civil Engineer. I have been married since 1991 to the same guy and we have a wonderful daughter. J's Games - Free Daily Puzzles! Kerr, Philip: "The One from the Other"
Pratchett, Terry: "The Bromeliad Trilogy: Truckers, Diggers, and Wings"